As Bill Auger, MD, prepares for another 60-hour work week at the University of California, San Diego Medical Center’s Pulmonary and Critical Care Division, his eyes meet his two-year-old granddaughter’s in the bathroom mirror, who giggles at the sight of him shaving. Good humor runs in the family. 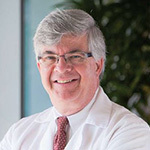 Dr. Auger (which carries the French pronunciation oh’jay), a revered clinician-educator, has mentored a generation of medical students, residents, and pulmonary fellows, and credits much of his success to his first mentor and greatest influence, Kenneth Miles Moser, MD, the mastermind behind the blood clot removal procedure—pulmonary thromboendarterectomy—now performed at UCSD and countless other centers. When Dr. Auger was first recruited by Dr. Moser in 1986, the operation was limited to three medical centers in the world. Today, in part to Dr. Auger’s leadership and training, over 40 medical centers in the U.S. and Europe currently perform the procedure. Studying chronic thromboembolic pulmonary hypertension (CTEPH) has been Dr. Auger’s life’s work. Up to 300,000 long-term survivors of pulmonary emboli occur each year, and one to four percent of patients go on to develop scar-like blood clots in the walls of the pulmonary artery. “People who have this problem experience a large decline in their capabilities,” Dr. Auger says. His division at UCSD manages waves of patients from all over the U.S., and the experience is especially challenging for families who must travel across country for the complex procedure. He works closely with referring doctors, screening patients, diagnosing their treatment, providing a full spectrum of care, and spending three weeks or more with patients during their post-operative recovery. Dr. Auger is widely regarded as the lead scholar and expert in CTEPH, a rare but increasingly recognized condition. In the 1980s, his team performed about one blood clot removal procedure a week. He helped figure out the best approach for patients and expand the program at UCSD. The team’s workload has grown to about one procedure a day. Patients who are not good candidates for the operation are considered for alternatives, such as pulmonary hypertension medications or balloon angioplasty. These innovative new therapies offer hope for those who can’t undergo the surgery. Dr. Auger feels fortunate to work at UCSD’s renowned pulmonary center and is proud of the program’s success. After nearly 15 years of planning, the team received funding to establish a CTEPH registry. The accomplishment was an important milestone, uniting multiple centers across nation under one common goal. Dr. Auger is also organizing the conference National Proceedings: CTEPH 2016, Feb. 26-27 in La Jolla, California, and is focused on evaluation and management of people with the disease. Before passing the torch to future clinicians, two of his major projects include medical textbooks on CTEPH and a longitudinal study on the benefits of this clot removal surgery. Perhaps his greatest adventure is a 30-year relationship with the ATS. He has made countless connections and found a community of providers caring for patients with the disease. “It has been an amazing networking opportunity,” he says. One case, one phone call, and one witty anecdote at a time, many of Dr. Auger’s closest and most enduring friendships stem from the Society.